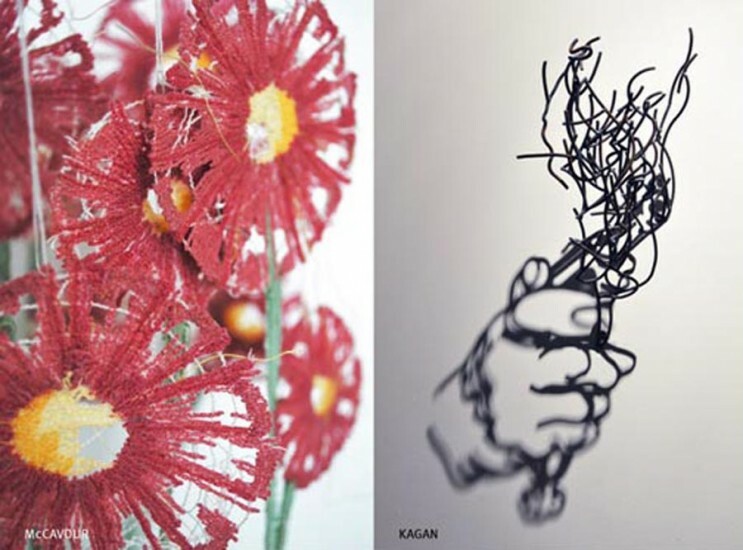 Artists Larry Kagan and Amanda McCavour use their work to explore the relationship between object and shadow. For Larry Kagan, shadow is an integral part of his work, he creates abstract steel constructions that when activated by light cast a shadow of representational imagery. Kagan’s intention is to force the viewer to shift their attention from the object to the shadow, thus imposing on the viewer to consider the origin of shadow. Amanda McCavour, in contrast to the permanence of the steel, creates drawings using thread. Creating both small figurative pieces as well as larger installations, McCavour strives to evoke a sense of 3D space by using variations of color meant to simulate natural shadows, the natural occurrence of shadows as light passes through the transparent thread, and also by physically installing the work to create a 3D space. Both artists utilize their mediums of steel and thread with the intention and hyper-awareness of the cast shadow as a means to challenge a viewer’s consciousness of light, object and shadow, and ultimately aspects of dimensionality.